This lesson plan will help students develop an understanding of the basic feelings of silly, proud, excited, sad, confused, mad and happy. Additionally, students will begin to learn what body language is and how to identify how someone may be feeling based on his/her body language. 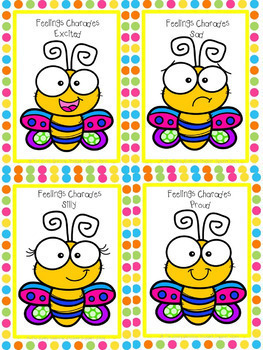 ✓7 feelings cards with the feelings of silly, proud, excited, sad, confused, mad and happy. 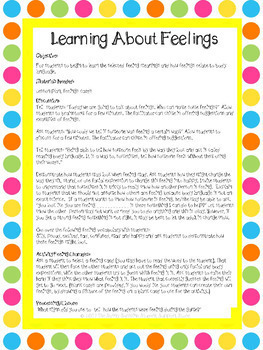 ✓Directions to play "Feelings Charades"
If you love this product, please consider leaving some feedback. It's always very much appreciated! By leaving feedback on your purchases, you can build up credits to use towards a discount on future TPT purchases (from any seller on TPT)! If you want to keep up to date with my sales, new resources, freebies and so much more click the green ★ under my store name! Please know that I spend a lot of time researching, creating, writing, and proofreading my work. However, typos or grammatical errors still sometimes occur. Please let me know if you find a typo or feel that a correction is needed, by emailing me at thesunnysunshinestore@gmail.com I value your input to make my products the highest quality possible. Thank you in advance for your help and support!